An almost-annual tradition in my family is attending Boulder City Art in the Park. Now in it’s 48th year, the event is held in the small town of Boulder City, Nevada about 45 minutes south of Las Vegas. This two-day event is generally held the first weekend of October and attracts over 300 artisans and 100,000 visitors. Much of the offerings are rather impressive – handwoven African baskets, pottery, jewelry, textiles, paintings, sculptures, and culinary delights such as mustards, infused oils and vinegars. Of course, I forgot my camera! I could have easily spent several hundred dollars, but my frugalness got the best of me. 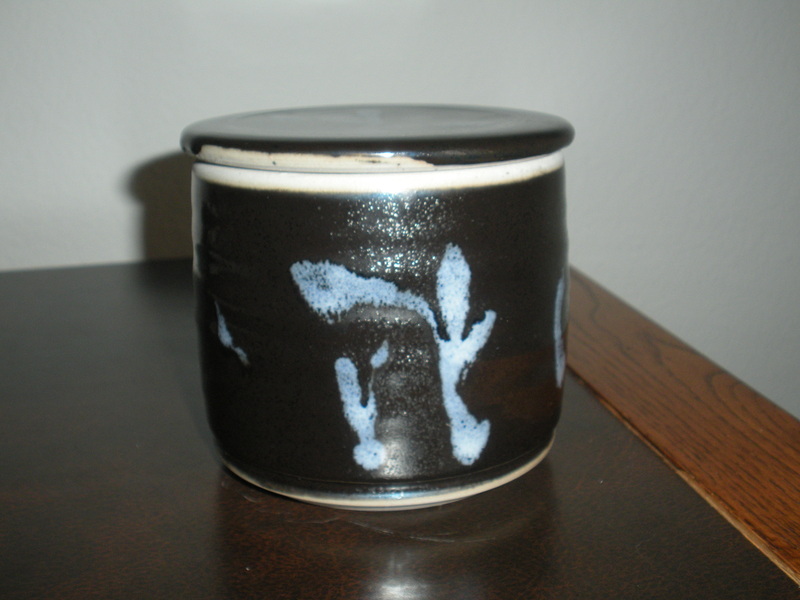 My one purchase was this French butter dish made by Liscom Hill Pottery Works. The entire event serves as a fundraiser for the Boulder City Hospital Foundation. The foundation generates a lot of funds from the Art in the Park raffle, which I am a big fan of since fate is involved. Every artist is required to donate at least one piece of artwork, plus there are other prizes donated such as hotel packages and gift certificates. 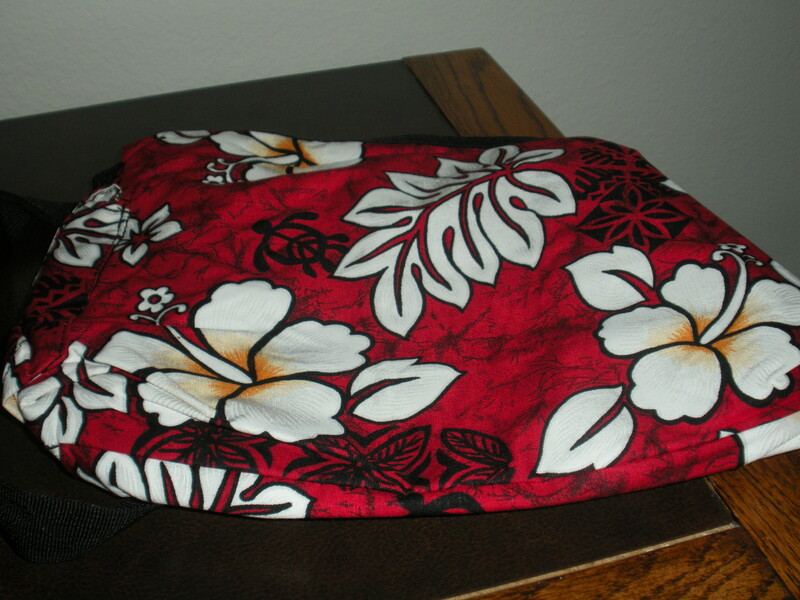 About an hour after purchasing my 6 tickets I received a phone call that I had won this Hawaiian-themed bag from Sun Connection. While basic fair food, Oktoberfest offerings, and a plentitude of alcoholic beverages are sold at the festival, my mom, friend Crystal and I chose to enjoy an air-conditioned lunch at the Boulder Dam Brewing Company, where microbrews and pub specialties abound. I opted for their seasonal Oktoberfest Marzen and a tuna wrap with garden salad — what I deemed as ‘a healthy choice.’ My mom and friend sampled the chili and bratwurst, and reported that everything was quite good. The event is held the first Saturday & Sunday in October. Although it is officially open from 9 am to 5 pm, we got there about 8:45 am and it was already crowded and vendors were open for business. Parking: Driving into town from Las Vegas/Henderson there were signs directing you to a park-and-ride that is quite a distance from the park, but will shuttle you there. We drove past this into town and parked on a residential street only about 4 blocks away. You might have to drive around a bit to find a spot and have awesome parallel parking skills, but there are generally spots available here. There is also paid parking ($8-10) available closer to the park. Most vendors accept credit cards, so you don’t have to worry about carrying a lot of cash. Temperatures in Boulder City in early October can reach close to 100 degrees, so remember to dress appropriately and drink lots of water. The website http://www.bouldercityhospital.org/art-in-the-park/ has loads more practical information on the event and the cause. This entry was posted in Becky's Adventures, Las Vegas. Bookmark the permalink.